I have been wanting to do a regular guest post feature on this blog for some time now. I first got the idea from our buddy Rick Kennedy, when he reached out to me so excited to share his story about his Granddaughter’s mule deer hunt when it happened last year. If you missed that one, you can check it out by clicking on this entire sentence. I love, love, love that people think of me, and this blog, and are excited to share their adventures, completely embracing the true meaning of what LIVE LONG IN THE OUTDOORS represents! The excitement of hunting season was finally here and the excitement was even greater as this was my first attempt at bow hunting for deer. 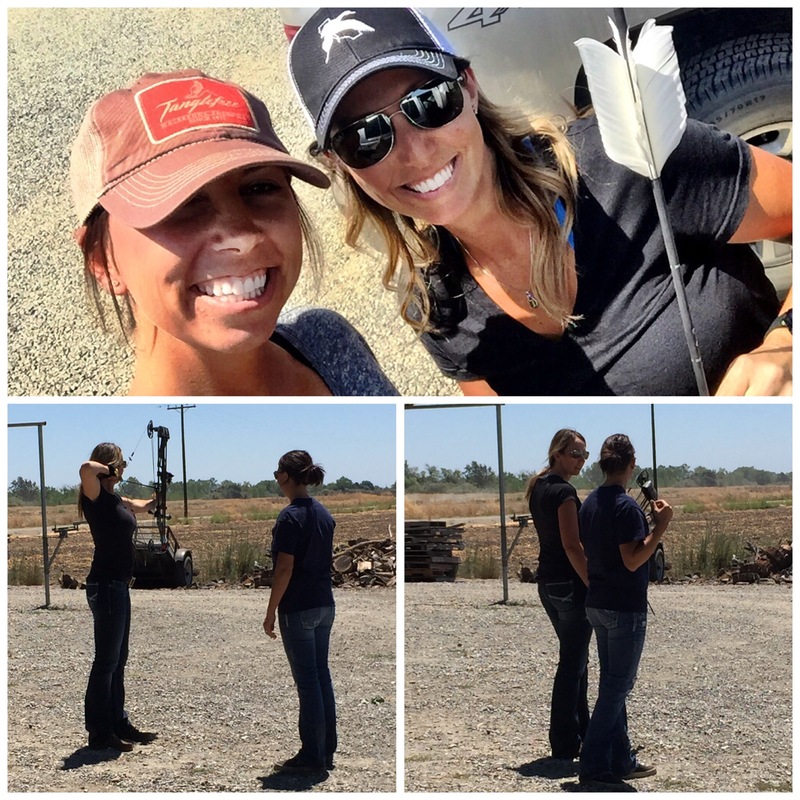 With help and tips from my boyfriend Josh and my good friend who happens to host this blog…I was feeling more confident and ready with my Elite Spirit bow. I have been with a few friends before on their archery hunts but I knew that it would be a whole new experience as I hunted for my own animal. The day arrived, as the mules and horses were packed for our adventure in the Trinities, I could not wait to start glassing the area for bucks. The evening before the season started, Josh spotted a nice forked horn and I replied that I would be so happy to take a buck like him for my first. The next morning we had plenty of legal bucks spotted including a beautiful 4 point that I spotted along with 3 other legal bucks. 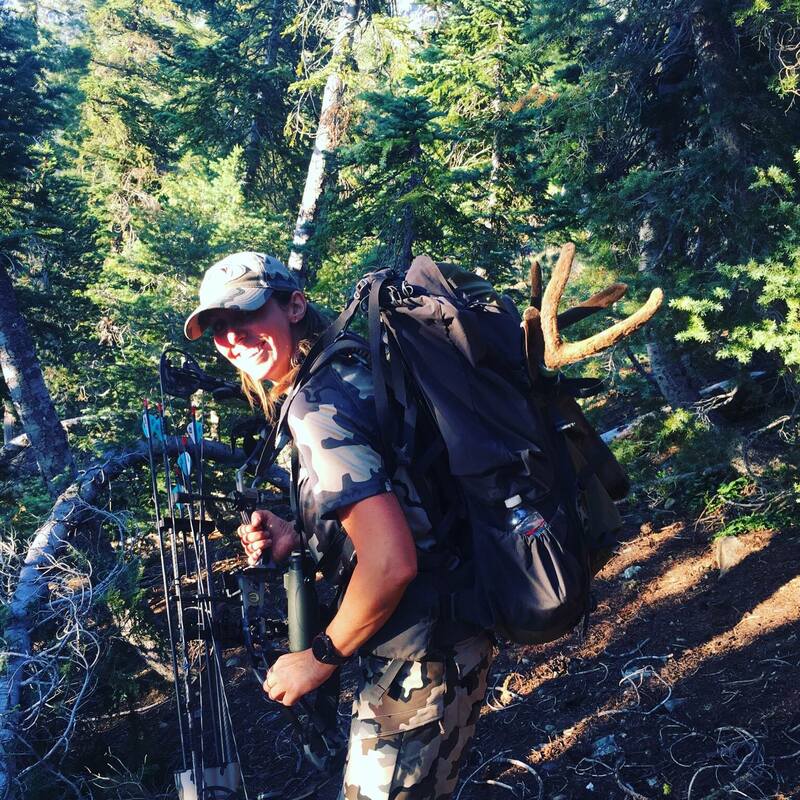 As we split up for the day to hunt I was not given any opportunities to draw my bow but I was enjoying every moment as I stepped softly around the wilderness in the hopes that I would run across something legal. As we made it back to camp for a short time before our evening hunt, I learned that our friend had come across that 4 point and he was now hanging in camp. I was so excited for him and his beautiful animal; I told Josh that I wanted to go and look for that buck from the night before as I was anxious to draw an arrow on my first buck. So we set out, yet again. As we were sneaking on the side hill, I was falling a bit behind as I am a “slow sneaker” when I suddenly saw Josh’s hand signal that meant he saw my buck. I was too far behind him to see the buck and my heart sunk, thinking I was possibly missing my first opportunity. Josh signaled for me to watch him as I snuck up to where the buck was but as I was almost there I heard the buck blow. We sat for a minute in silence; the buck had not seen us but had maybe heard us or scented us. As we sat and my emotions of disappointment almost set in, we saw him traveling around us through the trees. We lost visual of the buck once again until Josh saw something move straight in front of us; strangely enough this buck had snuck around us and bedded down facing us behind a log. A tree to the left of the buck blocked his visual of us as I stood motionless and in complete anticipation. I stood behind Josh and we whispered about the plan to take this beautiful animal. The hill was at about a 45 degree angle so the plan was to step downhill, around Josh while drawing my bow and stepping uphill so I could see the buck and take the shot. The plan was to shoot the buck in the chest but a log was blocking the shot; I got my bubble leveled and was ready to take the 37 yard shot on my first buck. I only had a head shot so I put my 30 yard pin on the top of his head and released my first arrow; the loud sound echoed and a yell of excitement came from Josh and then I as the buck tipped over out of his bed without getting up. The arrow was lodged square in between the eyes! As we walked up on him I put a second arrow in his heart to finish him quickly as he laid there motionless. Excitement filled every part of my body as we quartered him and I packed him back to camp. 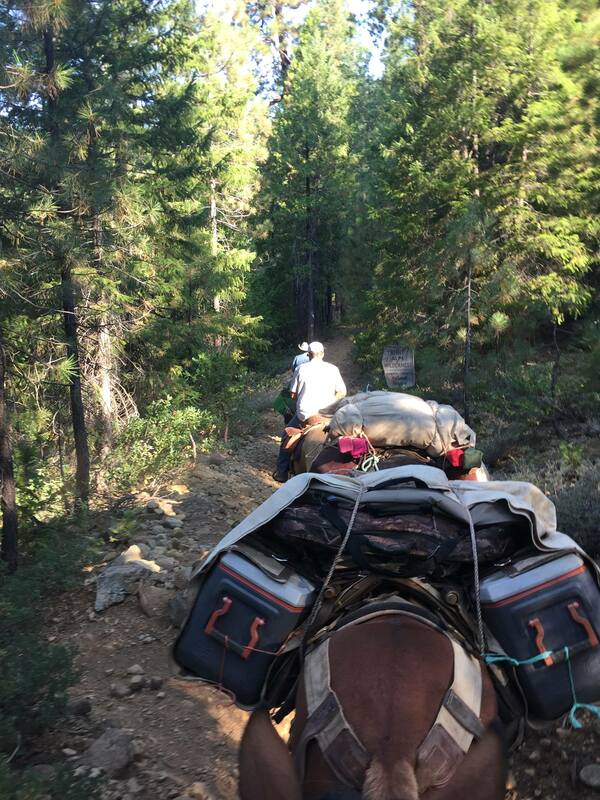 I was proud to see my buck placed on the back of a mule as we packed him out of the mountains and headed for the trailhead. It was the most exciting experience and was so much better because I got to share it with my boyfriend and best friend. To share the love of the outdoors with someone you love is something truly special. 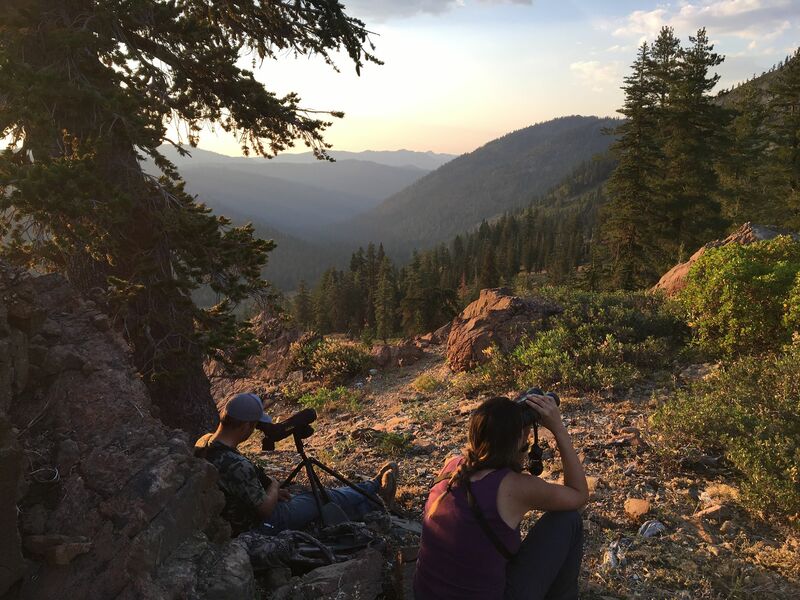 To have the experience to pack in to a beautiful part of the wilderness with Maverick Outfitters is something everyone should try at some point in time. I still have a bear tag to fill and can’t wait to get back out there! …So, After an incredibly tough opening weekend myself, I can’t tell you how relieved I was to hear Jen’s voice when we both finally got service to report into each other! SHE DID IT!!!!! I instantly had flash backs of the flood of emotions I had when I killed my first archery buck and was so dang happy for Jen and proud of her accomplishment! I admit I even teared up a bit when she posted her success on Facebook and thanked me for my tiny role in this big ‘ole lifetime memory. Pretty amazing stuff if you ask me and I’m pretty blessed to have a lady as cool as Jen as a friend and forever outdoor loving cohort! 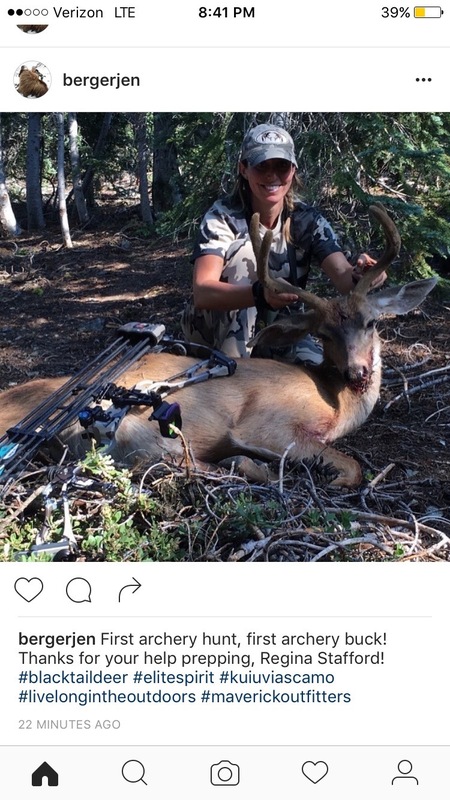 Thanks Jen for getting what it means to LIVE LONG IN THE OUTDOORS and sharing this memory with us!